How can so much awesome be packed into such a small package? ﻿WHO: Battlecomp, a world class manufacturer of superior compensating muzzle devices, is owned and operated by veterans and experts in fluid dynamics. This level of expertise has led to one of the finest recoil-reducing muzzle devices available for AR-15 rifles. WHAT: The Battlecomp 1.0, the original offering from Battlecomp Enterprises, is a standard length muzzle device which offers superior muzzle stability. The Battlecomp is also available in a 1.5 version (for 14.5" barrels to meet legal length) and a 2.0, which is compatible with some suppressors for direct mounting. The Battlecomp 1.0 retails for around $150. 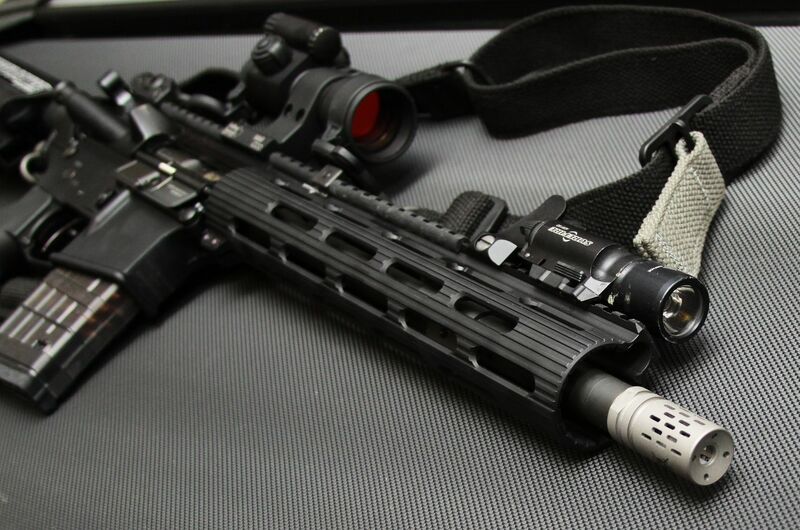 WHEN: I have been employing the Battlecomp 1.0 for over a year now on multiple AR-15 rifles. WHERE: This compensator has been employed in 3-gun competition and general training at home ranges. The Skinny: The difference in the standard A2 flash hider and the battlecomp is IMMEDIATELY noticeable. If you are cold and fire the first couple of shots, your muzzle will actually dip downward toward 6 o'clock, reminding you to keep the proper pull of the rifle securely into your shoulder. With a proper grip, the muzzle has little to no rise under both single and rapid fire. The only rise I have ever noticed is an occasional slight flip toward 1 o'clock. The concussion from the Battlecomp is slightly louder than an A2, and you will see more muzzle flash during dark light, however it is NOWHERE near as bad as a muzzle brake. Having compared to other brakes like the AAC 51t, the Battlecomp shoots just as flat with less concussion and flash. I don't find it necessary to use both earmuffs and ear plugs with this device at all. One set of protectors is fine for me. Another untique feature is the ability to get it in black and matte silver finish, which was perfect for my 3-gun build with a stainless steel barrel. I own both black and matte. For the current market, I will put a Battlecomp on every rifle I own. I don't think there is a superior device at this point. FINAL WORD: 10 out of 10 (must-have), because I totally trolled the Equipment Exchange for a Battlecomp when I found my first one.